It’s your day, the one you’ve spent months if not years planning, so why would you want to share it with anyone else? Thanks to the abundance of exclusive-use wedding venues in Scotland, you can make sure your wedding is all about you and your guests. Here’s our pick of the best exclusive-use wedding venues in Scotland for 2018. If you’re on the hunt for an exclusive-use wedding venue in the city centre of Glasgow, then this hidden gem could be the venue of your dreams! Located within the historic Royal College of Physicians and Surgeons of Glasgow building, it’s an unusual venue with real character and a super convenient location. 1599 can cater to up to 120 guests for your wedding breakfast and up to 150 for the evening reception, which means you’ll have plenty of space to invite everyone for a fun, atmospheric night of celebrating. Ballogie House, in Aboyne, is a stunning country mansion and exclusive use venue with beautiful uninterrupted views. You and your guests will have total privacy to relax and enjoy some time together before your big day! The house boasts contemporary interiors and seven beautiful en-suite guest bedrooms, including a bridal suite, meaning there’s plenty of room for everyone. Whether you choose Ballogie’s orangery or glass sided marquee for your celebration, each can be personalised to reflect your individual theme and style, making every Ballogie House wedding unique! The new and exclusive-use Barn @ Barra Castle, located in Oldmeldrum, is perfect for a rustic and stylish countryside wedding. This beautiful Scottish castle near Edinburgh offers a truly unique backdrop for unforgettable weddings and special events. Owned by the Earls of Rosebery for nearly 400 years, Barnbougle Castle is one of Scotland’s most outstanding heritage venues, blending location, tradition and historical significance. The castle has a variety of stunning original period features, including crowstep gables, crenellated parapets, a dramatic stone spiral staircase and marble sea-water bath, that will definitely appeal to history lovers. Boasting a magnificent location with private beaches framed by woodland and landscaped grounds, the castle can cater for up to 120 guests with larger wedding parties of up to 450 accommodated in marquees in the grounds. An exquisite exclusive use Scottish castle in Pitlochry, Perthshire, you’ll be swept away in your very own fairytale if you decide to marry at Blair Castle. The castle’s beautiful grounds offer a dramatic backdrop for an outdoor wedding ceremony, whilst it’s warm, cosy interiors are packed full of character. The spacious Ballroom can hold a celebration for up to 220 guests, but its unique hunting lodge aesthetic means that it will still seem lively and full with a more intimate number of only 60. A beautifully unique boutique hotel with stunning, luxury suites and a grand ballroom, Boclair House Hotel in Glasgow’s west end is perfect for a sophisticated, chic wedding. Boclair House will be exclusively yours for the day, providing a real taste of luxury for your special day. You’ll have complete privacy and the whole team of staff will be focused solely on accommodating you and your guests. At Boclair House, no detail is too small or request too large. This stunning luxury mansion sits in its own ancient woodland, famed in Victorian fairytales, in the heart of the picturesque Scottish Borders just an hour’s drive from Edinburgh. The fairylight-lit grounds are enchanting, the views of the Teviot Valley are breathtaking, and the plush boutique interiors of the mansion are second to none. Branxholm Park offers three-night exclusive wedding packages that are almost all inclusive and at a surprisingly affordable price, so you can celebrate with a luxe wedding weekend. Located in the grounds of a beautiful mansion house in Perthshire, this original cattle barn dates back to 1877 and features lovingly-restored original architectural details. The high quality interior decor and fantastic state-of-the-art lighting and sound facilities are all part of this gorgeous blank canvas barn; all you have to do is let your imagination run wild. Don’t worry though, you’re not alone in planning your big day party. The team at Inchyra are on hand to help you every step of the way, should you need it. Carefully restored from a ruin in 1957 and now a prettily turreted building that stands in the rural countryside of Aberfeldy, Castle Menzies is a stunningly romantic location for a wedding. Some areas of the castle are open to the public during the daytime, but you can hire the castle on an exclusive use basis (the surcharge for this varies depending on what time of year you’re getting married!). The castle is beautiful inside and out, with a selection of gorgeously opulent function suites to choose from when planning your big day. The grand Dewer Room is a stunning and spacious ballroom that can accommodate up to 120 guests for your wedding breakfast, while the charming Main Hall can hold 54 guests for a more intimate celebration. Secreted away in the lush Aberdeenshire countryside, stunning and historic Cluny Castle is a straight out of a fairytale. With sprawling parklands and lawns, and a winding driveway leading up to the impressive castle, there’s no denying that this venue is beautiful – and that’s before you even step inside. Hire the castle on an exclusive-use basis and enjoy complete privacy. The team at the castle are there for you to lean on if you need to, and help you to create a day that’s as unique as you are. As well as it’s own onsite chapel, accommodation is also available at the castle, including newly refurbished luxury bedrooms, which means you can extend the celebrations with your nearest and dearest – why should all the fun come down to just one day anyway? Originating in 1296 and steeped in hundreds of years of Scottish history, couples looking for an authentically Scottish wedding venue should look no further than Culcreuch Castle Hotel. Hidden in the countryside but only a short drive from Stirling, Culcreuch Castle has stretches of ruggedly charming countryside on its doorstep, with many beautiful spots for couples who wish to have an outdoor wedding ceremony. If you would like to say your ‘I dos’ inside however, the stone walled Galbraith Hall is perfect. Dressed for a wedding and lit with candles, it has the sweeping romantic ambiance that only Scottish weddings can pull off! Originally an 18th-century manor home, Dalmahoy is now a stylish hotel wedding venue with gorgeous grounds – you can even catch a glimpse of Edinburgh Castle on a clear day! Each of the hotel’s function suites are elegant, but we especially love the Dalmahoy Suite for a wedding ceremony. It’s a beautifully decorated and spacious room with floor to ceiling bay windows, and a wonderful romantic atmosphere for your wedding nuptials. It can then be converted into a fantastic reception space with room for up to 250 guests. Edinburgh’s five-star Dundas Castle is the ultimate exclusive-use venue for fairytale weddings. It has recently seen double success at the Scottish VOWS Awards, winning ‘Wedding Venue Edinburgh, Lothian & Borders’ and the coveted ‘Scottish Wedding Venue of the Year’. At the 18th century luxury Castle, couples enjoy a level of service which is second to none, with a dedicated wedding organiser and the opportunity to marry in various beautiful locations. Whether the ceremony takes place in the magnificent 600-year-old Auld Keep, or outdoors in the Courtyard or gardens, Dundas Castle is one of the most unique places to say “I do” in Scotland. Along with the outstanding location and service, a superb team of catering professionals is on hand to carefully design creative and delicious wedding menus. Plus, the perfect day can end in style, as couples can spend their wedding night in the romantic Boathouse, a unique hideaway on the shores of Dundas’ private loch. A stunning and historic property in the Scottish Borders surrounded by beautiful trees, rolling hills, a loch and a nature reserve that stretches for a mile, Duns Castle is the epitome of tranquil countryside romance where starry nights are in abundance. No matter what size of wedding you have, from a huge celebration to an intimate get together for close family and friends, Duns Castle can accommodate your wishes on an exclusive use basis. This award-winning, 1200-acre estate can sleep up to 56 guests and offers incredible value and a multitude of bespoke activities with which to delight your guests. Hidden away in the picturesque North Lanarkshire countryside, Eden Leisure Village is a wedding venue that offers a rustically idyllic backdrop to your wedding celebrations. The 25-acre site is beautiful and extensive, and you can get married outside on the manicured lawns which boast fantastic views of the surrounding hills and forests. Then you can celebrate your reception in the brand new converted barn, a fantastic blank canvas space that is perfect for couples looking for a rustic and relaxed wedding venue. The site also has an amazing glamping area complete with a lodge, glamping pods and hobbit huts – great for guests looking for overnight accommodation! A truly stunning exclusive use wedding venue that stands high on a hill in Kingston, North Berwick, Fenton Tower will blow you away with its uniquely Scottish charm. You can exchange your wedding vows in the Great Hall beneath a beautifully woven c tapestry while a log fire gently burns and crackles in the background. Wedding breakfasts and receptions for smaller weddings can be hosted in the vaulted Dining Room, while larger celebrations can spill outside into a spacious marquee on Fenton Tower’s beautiful grounds. Set in one of the most beautiful gardens in the hills between Dundee and Perth, Fingask Castle can accommodate weddings both big and small, with options for exclusive use available. The outdoor Pavillion is fantastic for large celebrations, with views that stretch out to the castle and the amazing grounds. For more intimate weddings, you can celebrate in the castle itself surrounded by your nearest and dearest. Fingask also has plenty of onsite accommodation in the form of brand new luxury ‘Potting Sheds’ as well as a selection of cosy and spacious cottages sleeping up to 70 guests in total. Floors Castle and Gardens is a truly enchanting wedding venue that stands proudly on the Roxburghe Estates in the Scottish Borders. The building itself is absolutely stunning, both inside and out. Its grand façade is a sight to behold, and the interior boasts beautifully furnished rooms and a wonderful fine art collection. But it is the gardens that will attract couples looking for a dreamily romantic location for their wedding day. The Walled Garden is filled with wild and colourful plants and flowers, and is a wonderful location for a wedding ceremony, while the Star Plantation is filled with large trees, open glades and woodland shrubs and is a fantastic backdrop for your couple portraits. The gardens also hold the Queen’s House, which is included in all garden weddings at the castle. This charming summer house was built especially for Queen Victoria’s visit in 1867 and was where she took tea. The Music Room can hold up to 60 guests, the Reception Room can hold up to 150 guests and the Rose Garden marquee can host a big celebration of up to 200. Up to 26 guests can stay in the 10 double bedrooms in the house and three bedrooms in the lodge. Located in the countryside at the foot of the Pentland Hills, this stunning manor house has hidden depths that ensure you’ll have a truly romantic wedding day. An exclusive use wedding venue, you’ll be able to celebrate your special day in the bright and airy marquee surrounded by its pretty gardens and extensive grounds. You can even tie the knot in Glencorse’s Old Kirk, which eagle-eyed TV fans might recognise as the same church that lovers Jamie and Claire got married in on TV show Outlander – it doesn’t get more romantic than that! With their One and Only offer for 2019 at Glenskirlie House and Castle, your big day setting will be exclusively yours when both the House and Castle are free on your chosen date. You’ll be able to choose from the two properties available onsite at Glenskirlie, Glenskirlie Castle and Glenskirlie House, for your celebrations. You’ll be able to have your closest family and friends stay in the castle’s 15 individually styled bedrooms, and there’s even two honeymoon suites to choose from! Whether you’re having a big party or a small, intimate wedding, Glenskirlie Castle will provide the perfect fairytale backdrop. Innes House is a 17th century family house set within magnificent grounds. The house boasts a totally unique marquee – the covered walled garden, complete with a fountain, really is the stuff of fairytales. You can tie the knot in the garden or choose from two elegant reception rooms indoors. Everything you need to entertain your guests is on hand, including a bar housed within the marquee’s summer house. Even if the weather’s not playing ball you’ll still feel like you’re tying the knot outside. Exclusively yours, Kincaid House Hotel is a picturesque Grade A listed building, with many period features, secluded in its own magnificent grounds. The light-filled conservatory is perfect for your ceremony and the walled garden makes an ideal backdrop for photographs. The nine spacious en-suite rooms are beautifully decorated and furnished and are all reserved for you ensuring you have exclusive use for the duration of your stay. This warm, cosy venue draped in sparkling fairy lights and lit with flickering candles will sweep you off your feet with its romantic ambiance. Situated in St Andrews, you can exchange vows outside overlooking the town’s gorgeous coastline or inside the atmospheric stonewalled byre surrounded by your nearest and dearest. The Byre is an exclusive use blank canvas venue, allowing you to create a completely bespoke wedding day that you can enjoy with up to 120 guests. With panoramic views of the bonnie banks of Loch Lomond, this waterside wedding venue is perfect for a traditional and romantic Scottish wedding day – it even has it’s own exclusive beach! If you really want to embrace your scenic surroundings and the 18 acres of stunning private grounds, you can hold your reception in a marquee or tipi on the grounds. You can also book the entire place – all 18 acres, the function suite and 11 lodges – on an exclusive use basis. Logie Country House is a spectacular exclusive use wedding venue which has a history that stretches back all the way to the 15th century. Withstanding centuries of romantic Scottish history, the house now has 15 bedrooms, an indoor pool and a purpose built ballroom that is perfect for dancing the night away with up to 180 members of your friends and family. This is a fantastic venue for couples looking to hire their wedding venue exclusively over a period of a few days or a weekend. You can host an intimate dinner with your family the day before your wedding, and then have a huge BBQ the day after for the wind down! Set amidst mature woodland in the heart of the magnificent Trump Estate just outside of Aberdeen, this opulent five-star hotel is the ultimate venue for your intimate, private wedding. With secret stairways, traditional log fires, whisky bar and spectacular grounds, MacLeod House & Lodge is a fully licensed Scottish wedding venue able to hold both wedding ceremonies and exquisite celebrations and receptions. For the larger wedding, the team can install a dedicated marquee, pitched on the manicured lawns of MacLeod House. Available for partial or exclusive use throughout the year, the venue also has sixteen bedrooms boasting many charming characteristics and period features unique to each guest room, perfect for your loved ones to stay and celebrate. Undoubtedly one of Scotland’s premier luxury hotels, Mar Hall near Glasgow has breathtaking views of the Kilpatrick Hills and 240 acres of ancient woodland estate. You can get married in a variety of different spaces, like the stunning and contemporary Garden Pavillion, the intimate Kilpatrick Suite, the romantic Burgundy Suite or the elegant fully refurbished Morton Hall Ballroom – there’s even an option for exclusive use. It also boasts 53 luxury suites, the Decleor Spa (ideal for a spot of post-wedding relaxation) and the Earl of Mar Golf course designed by Dave Thomas. It’s perfect for your garden wedding – no matter what size – and offers peace, tranquillity and plenty of photo opportunities. In fact, it’s a photographers dream to film in such surroundings, with walled gardens, lily water ponds, woodland pathways, Kinkell Bridge and many more hidden corners. Millearne house, with the architecture of the original stables, is the perfect backdrop for your marquee. Myres Castle, winner of Best UK Wedding Venue in the Hudson UK Heritage Awards 2018, is a whimsical and romantic wedding venue situated near the village of Auchtermuchty. The best of both worlds, you can have the stunning castle for up to 24 guests throughout your stay, and celebrate your wedding in the rustically charming Barnquee. The Barnquee is situated in a lovely woodland setting, with twinkling lights hanging from the trees and fire pits outside (as well as a wood fired pizza oven!) to further add to the magical atmosphere. Although it’s just on the outskirts of Edinburgh, Newhall Estate feels a world away from city life with it’s scenic grounds. The idyllic setting looks picture-perfect all year round, so you’ll always be guaranteed gorgeous wedding photos. Steeped in history, this hidden gem is an exclusive use venue that’s known for its enchanting atmosphere and poetic elegance. There’s room for up to 170 seated guests in the Coach House and there’s also onsite accommodation for up to 38 of your closest friends and family. Five-star Pitcairlie House is a sweetly romantic wedding venue surrounded by reams of wholesome Scottish countryside near the seaside town of St Andrews. You can hold your nuptials in the grand drawing room or, if you would like something a little more relaxed, you can say ‘I do’ around the lake or on the lawn in front of the house, a beautiful setting by the copper beech tree. Perfect for intimate boutique weddings of up to 60 guests, Pitcairlie’s wedding package is based on a two night stay for you and your guests, with luxury accommodation for up to 33 in the main house, four apartments and on-site cottage. The ideal setting for couples looking for a weekend or week long celebration! Raemoir House is an exclusive-use venue sitting within a secluded 14 acres of lawns and parkland, but is conveniently only a mile from Banchory and 20 minutes from Aberdeen. It’s a grand Scottish country house where you have the freedom to create your own day, whilst being able to stay with family, friends or colleagues and enjoy the privacy of the unique surroundings. If you’re feeling adventurous for your wedding photos, you can leave the lawns of the gardens for the Hill of Fare (it’s easily accessible from Raemoir’s grounds) and have panoramic views out across the countryside as a picturesque backdrop for your couple shots! If getting away from it all is your idea of heaven, you’ll fall for the rural charms of Rottal Estates, a new wedding venue in the heart of Glen Clova. Surrounded by stunning scenery, the dramatic views are perfect if you’re hoping to enjoy an outdoor ceremony, but the steading also provides a blank canvas to style however you wish, with the help of the estate’s onsite wedding planner. What’s more, you can hire the entire estate exclusively with accommodation for up to 26. A new wedding venue set in tranquil private grounds, Silverwood is a luxury holiday lodge and bistro resort set in the Rustic Carse of Gowrie, just minutes from both Perth and Dundee. Offering exclusive use for your big day celebrations, you can also opt for a marquee wedding, complete with everything to make it a party to remember, from the dancefloor to the bar. Catering for around 100 guests, your nearest and dearest can relax and stay in the bespoke holiday accommodation, which has been hand crafted to give you the comfort that you desire. Set in 1,000 acres of secluded grounds and woodlands, which include a loch, Strathallan Castle offers the utmost privacy whether planning a large and lavish event or something smaller and more intimate. You’ll have exclusive use of the castle for the day, with the undivided attention of the first-class team. They want your wedding day to be as unique and special as you are, and will be on hand to ensure all your wedding dreams come true. In addition to the beautifully appointed reception rooms, the castle offers a top-of-the-range luxury marquee which means you can invite everyone you want to be with you to celebrate your big day. Located on the edge of the historic market town of Strathaven, this family-run hotel offers a peaceful and picturesque setting in South Lanarkshire while only being a short drive from Glasgow. Exclusive use options are available. One of the most popular venues on Loch Lomond, The Cruin offers couples a space that they can truly call their own. The Lochside Terrace and ceremony suite both have panoramic views across the loch to Inchmurrin Island and Ben Lomond – the perfect space to hold your wedding ceremony. With a roaring log burner, it also transforms to become a cosy and relaxed area for your guests to enjoy bubbly and canapés as you are whisked away by your photographer to take advantage of the stunning grounds to create the perfect memories. Right in the heart of the city of Glasgow overlooking George Square proudly stands the Merchant’s House, a grand mansion which dates back to 19th century, steeped in history. This venue is ideal for celebrations of all sizes, whether you go for an exclusive use option or not; the Grand Hall, complete with show-stopping Steinway Grand Piano, can hold 130 for a sit down wedding breakfast, or perhaps you’d prefer the unforgettable Directors Room, which can seat up to 60 for a formal dinner. Take advantage of the fantastic location and have your wedding photos taken among the hustle and bustle of the city. Even though Tullibole Castle is a beautiful and stately Scottish mansion nestled in the Perthshire countryside, it has a relaxed, easy going atmosphere that will make you never want to leave. Luckily for the weekend of your wedding, you won’t have to! Exclusively yours over three days, you can prepare for your wedding on the Friday, have your ceremony and reception on the Saturday, and chill out on the Sunday with a BBQ or even a round of lawn games! You are also spoiled for choice when it comes to choosing a spot for your wedding ceremony. You can exchange vows in the castle itself, or have a more laid back ceremony in the rustic-luxe Carriage House or outdoors in the stunning grounds. Get married at Turin Castle in the heart of the scenic Angus Glens and enjoy full exclusive use of the castle and gardens throughout your stay! It’s perfect for enjoying a luxe wedding weekend with your nearest and dearest. On the Friday night relax over dinner and drinks in the bar with family staying in the castle, then celebrate your wedding in style on Saturday, before spending Sunday night gathered round the firepit, toasting marshmallows and a few last drinks. You can hire a chef or self-cater, have a game of six-hole mini golf on the course in the grounds, and even arrange extras like falconry and gin or whisky tasting to really create some fun, lifelong memories with your loved ones. Winton Castle near Edinburgh blends castle, palace and family home. A Scottish Renaissance castle and an exclusive use venue, it’s all yours for the duration of your wedding. 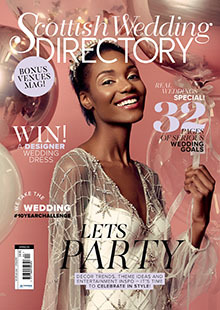 Their wedding planner will help you choose the format and style of your big day, which really is up to you – whether you fancy a garden party, a firework display finale or otherwise! Your wedding guests will love Winton’s warm welcome and relaxed ambience. The castle hosts weddings for 50 to 130 guests inside and can accommodate 100 to 400 guests in a marquee. Are you dreaming of a proper fairytale-style wedding? Take a peek at our pick of the best Scottish castle wedding venues! Check out the designer bridalwear collection at Kudos Bridal Dunfermline!